The internet needs very little prompting to create hashtags that combine beloved hip-hop musical Hamilton with other cherished properties. That’s how the hashtags #ParksAndHam (featuring Parks And Recreation) and #30Ham (featuring 30 Rock) got started. 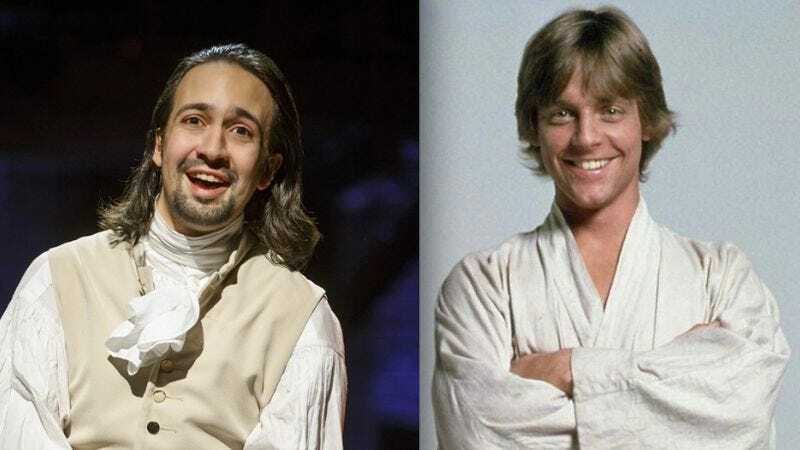 So when J.J. Abrams broke the news that Hamilton composer Lin-Manuel Miranda helped him write a new cantina song for Star Wars: The Force Awakens, the internet knew exactly what to do. The hashtag #Force4Ham has brought to light just how many crossover sci-fi/musical theater fans exist on Twitter as users combine images from Star Wars with lyrics from Miranda’s Broadway show. Naturally, it helps that Star Wars is the Hamilton of sci-fi while Hamilton is the Star Wars of musical theater (that is, they’re both properties that appeal to mass audiences well beyond their genre’s usual purview). Miranda himself has officially sanctioned the hashtag, explaining that Hamilton director Tommy Kail filled him in on the popularity of #Force4Ham even though Kail doesn’t even have a Twitter account. Some of our favorites are below, but as Manuel’s tweet emphasizes, the hashtag is crammed full of good stuff. Most of them require a passing knowledge of Star Wars (which people have amassed over the past 38 years) and an intimate familiarity with Hamilton (which people have amassed over the past three months). Naturally, some of the tweets cast a little shade on the less-than beloved elements of the prequels. Others, meanwhile, are already looking forward to the new trilogy. And still others are strangely poignant. While we’re not 100 percent sure former A.V. Club contributor Ryan McGee started the hashtag, we’re going to at least give him partial credit.